Input text: the [trump] wall. 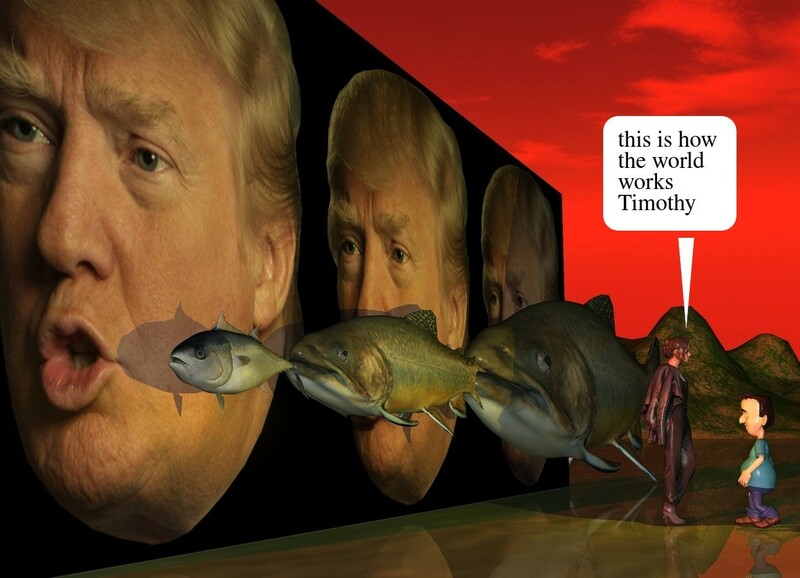 the first fish is in front of and -6 feet to the left of the wall. it is facing left. it is 19 inches above the ground. a second very huge fish is -6 inches to the right of the first fish. it is 16 inches above the ground. it is facing left. the third very enormous fish is -17 inches to the right of the second fish. it is on the ground. it is facing left. it is dusk. the sun is red. the gold light is 3 feet in front of the second fish. the small woman is 4 feet in front of the wall. the boy is 6 inches in front of the woman. he is 2 feet tall. he is facing the woman.